THE GATEWAY TO THE CAPITAL OF JAPAN. Yokohama is only some eighteen miles from Tokyo, the capital, and transport facilities between the two cities are excellent. The harbour affords good and safe anchorage for vessels of any size which can load or discharge at the quays, piers or buoys. There are also wet and dry docks and shipyards, with facilities for repairs and overhaul. In one year 3,456,000 tons of shipping entered Yokohama and 3,359,000 tons were cleared. IN a few moments at noon on September 1, 1923, the great city and port of Yokohama, Japan, was shattered by an earthquake. Fire swept the city. About eighteen miles away, Tokyo, the capital, was devastated by the same earthquake. The Japanese were faced with a terrible loss of lives, an appalling roll of injured, and the task of rebuilding their capital and their famous port. A reconstruction bureau was set up, the ruins were cleared away, and on their sites arose still greater cities, built on a new plan. The seafarer entering the port of Yokohama sees before him a monument to the courage, engineering ability and resource of the Japanese. All is new, and the port is growing steadily - a symbol of the changing East. Yokohama is the port for ships from the West and East. Before the arrival of the white man, less than a century ago, there were a few score of poor fishermen’s homes huddled together. When the modern city was rebuilt after the disaster of 1923 it had an area of 50·87 square miles; in 1934 the population had grown to 703,900, including foreigners, from the total of 442,600 eleven years before. It took some six years for the Government and the municipality to reconstruct the city and the breakwaters, piers and equipment of the harbour. The boundary was widened to bring in neighbouring towns and villages, so that the area is about three times that of the old city. One of the best known and most used of modem ports, Yokohama is either a terminal or a point of call for a number of great steamship lines which link it with capitals as far distant as London and New York. It lies on the west side of Tokyo Bay, and is approached from the Pacific through the Uraga Channel. Vessels, whether from Great Britain or from America, approach through this channel, which lies between the Miura Peninsula on the west and the Boso Peninsula on the east. In clear weather the majestic cone of Mount Fuji can be seen rising 12,467 feet into the sky. To the south is the volcano of Mount Mihara, on the island of Oshima. As the vessel nears the entrance to the Bay of Tokyo, the town of Uraga, where the modern history of Japan began, is to port, and later the naval base of Yokosuka opens out. Here are naval dockyards, and the battleship Mikasa, flagship of the Japanese Fleet at the time of the Russo-Japanese War, is preserved on shore. Admiral Togo is the Nelson of Japan, and his flagship is the Japanese Victory. In the park are the memorial tombs of Will Adams, “the first Englishman in Japan”, and of his Japanese wife. Will Adams, who was born at Gillingham, Kent, was the pilot of a Dutch ship, the only vessel of a fleet that sailed for Japan to arrive there in 1600. Realizing the value of his knowledge, the Japanese prevented his leaving the country and employed him to teach them shipbuilding. A NOVEL METHOD OF COALING at the port of Yokohama. 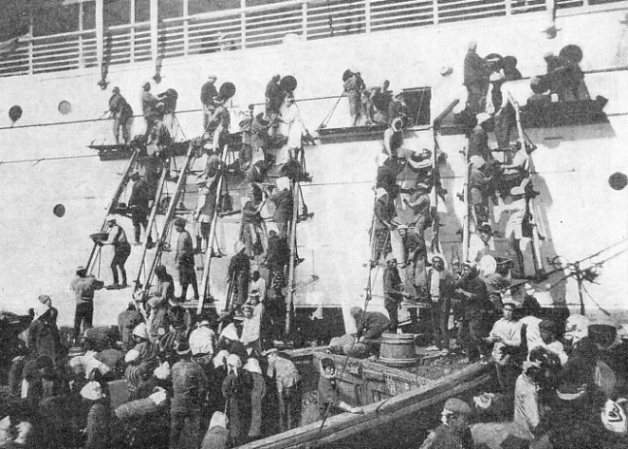 Coal is handed up from the barges at the side of the ship by scores of workers who form living conveyer bands. This illustration shows men and women “coal-passers” at work by a British liner. These Japanese “coal-passers” are world-famous for their speed and skill. Soon the passengers see the masts and funnels of the ships lying in Yokohama Harbour. A new outer breakwater that, at the time of writing, is being built is nearly completed. After the medical authorities have given her pratique, the ship passes through a gap in the inner breakwater to her berth. Tokyo lies at the head of Tokyo Bay, about eighteen miles from Yokohama, but the bay shallows. Much dredging has been done recently, and 6,000-tons steamships can now enter the harbour, but liners and large vessels go to Yokohama. Some of the cargo is discharged into junks and other craft, and taken to Tokyo. Yokohama Harbour affords good and safe anchorage for vessels of any size, which can load or discharge at quays, piers or buoys, and there are wet and dry docks and shipyards, with facilities for repairs. The port opens to the southeast. Low hills to the south-west protect it from south-west winds; but it is exposed to winds blowing across the Bay of Tokyo from the south-east in summer and autumn. Prevailing winds in the winter are from north to northeast. As the distance across the bay from north-east to east does not exceed twenty-seven miles, high seas are not experienced; those entering the bay from the south are checked by the coast. The inner breakwaters extend in a curve from north to south so that the inner harbour, of about 1,121 acres, is well protected. The new outer breakwaters have been designed to give an additional sheltered area of some 2,040 acres. 6,000 tons, and three of 3,000 tons. A long pier projects from the south-eastern part of the embankment where four vessels of 30,000 tons each can be moored at once. There, are twenty-three buoys for mooring ships, berths for seven vessels and dock accommodation for thirteen, so that the total possible capacity of the inner harbour is sixty-four ocean-going ships. The outer harbour accommodates fifty or sixty vessels, so that the total is well over a hundred. Half of the eighteen-miles coast-line of the city is covered by docks and warehouses, and much land is continually being reclaimed for industrial sites. There are some 3,000 lighters of various kinds and many sizes of tugs with varying powers. 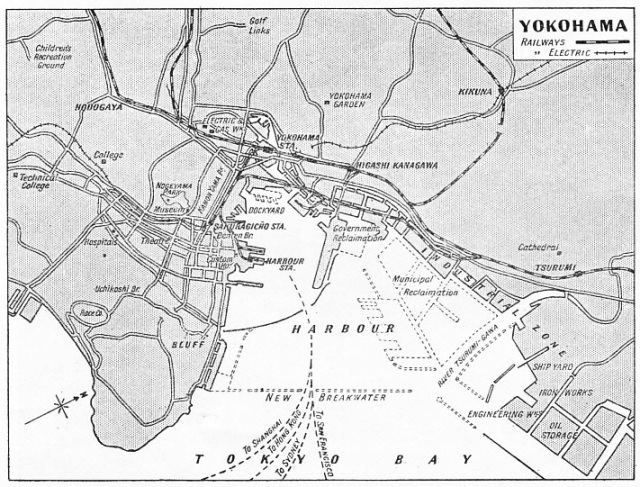 OF PARAMOUNT IMPORTANCE to the industrial life of the Japanese Empire, the port of Yokohama is clearly indicated on this map. Near the entrance to the Bay of Tokyo is a big naval centre where there are many dockyards. The biggest floating crane lifts 120 tons, and there are five others which lift from 30 to 100 tons. The wet dock of the Yokohama Dock Company is 600 feet long and 180 feet wide, and the same company’s dry docks are - No. 1 is 640 feet by 93½ feet; No. 2 is 400 feet by 60½ feet; No. 3 is 495 feet by 67½ feet. The two dry docks of the Uraga Dock Company are 497 feet by 70 feet and 456 feet 10 inches by 65½ feet respectively; the two of the Asano Dock Company, 659 feet by 93 feet and 495 feet by 71 feet. As the region comprising Yokohama and Tokyo is one of the most densely populated in Japan, the port is one of the busiest in the country. Its rival is Kobe, which, as with Yokohama, is of mushroom growth, and is the larger. After the earthquake Kobe secured much of the trade, but Yokohama soon recovered. It is the natural gate to the capital and is a portal through which have flowed those Western ideas which have changed much of Japanese life. Uraga, on the west side of the entrance to Tokyo Bay, was the scene of the landing of Commodore Perry of the United States Navy in the ’fifties of the last century. After his landing a treaty was signed and a part of the foreshore of what is now Yokohama was leased to foreigners. The town, thus founded, began to grow from 1859, but eight years later was swept by a disastrous fire. At that period there were only two mail-boats a month, and there was no cable communication. The damage done by the fire was remedied and Yokohama got into its stride. It became a municipality in 1889 with a population of over 120,000. In that year the building of the two breakwaters that enclose the inner harbour was begun, these being completed in 1896. These two breakwaters, of a total length of 12,080 feet, enclosing a safe anchorage of some 1,200 acres, with an iron pier, 1,906 feet long, and 63 feet wide, capable of berthing six ships of 26 feet draught, had scarcely been completed when the rapidly-growing trade caused further developments. The first extension work was begun in 1899 and completed in 1902, and the second was begun in 1906, and completed in 1917. This period had many incidents. A typhoon, in 1902, did considerable damage to the breakwaters, entailing costly repairs. 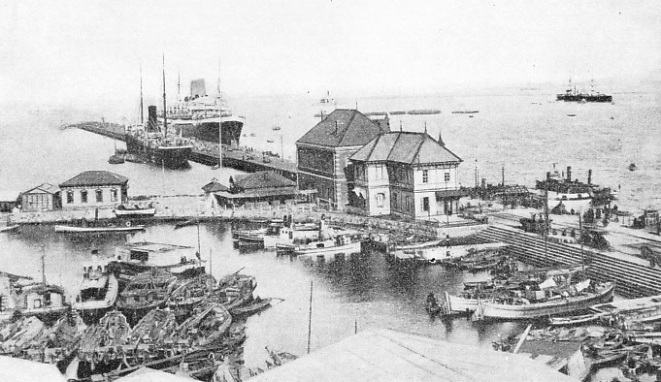 By 1917, however, Yokohama was one of the best equipped ports in the world, as it was new and had the most modem appliances. 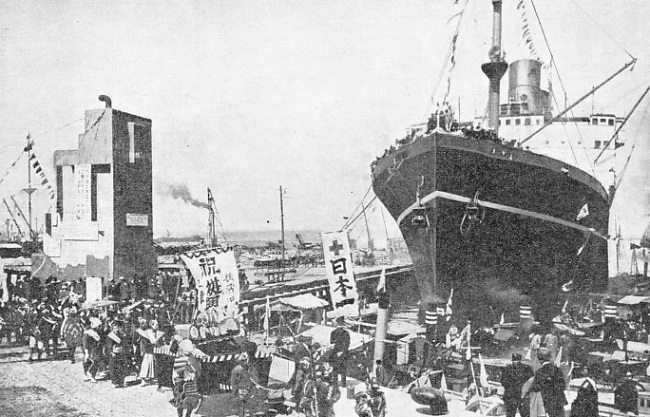 The war of 1914-1918 gave Japanese trade a tremendous impetus and shipping benefited greatly. In addition, the opening of the Panama Canal, which was begun in 1881, completed in 1914, and opened for general traffic after the war, brought further trade, as Yokohama was afforded a route to the Atlantic seaboard of the United States. The West has been an increasing outlet for Japanese goods, and these are, to a great extent, carried in Japanese ships. Even when the first slump came after the war Yokohama was in an enviable position. In touch by sea with practically the whole world, the port had led the way in every modern development. The first railway in Japan was that between Yokohama and Tokyo. The coastal shipping trade had been fostered, and foreign and Japanese banks concentrated at Yokohama as the great port of enterprise. 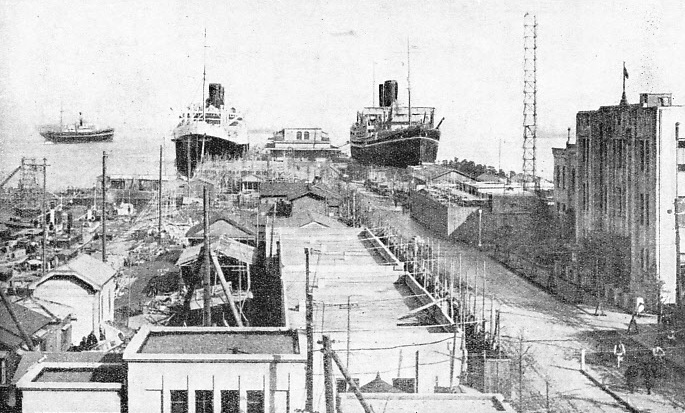 A ten-years’ programme of harbour extension was begun in 1921. By 1923 practically all the raw silk of Japan was exported from Yokohama, and it was a centre of finance and industry. A PLAN of the city and port. The inner breakwaters extending in a curve from north to south provide about 1,121 acres of protected water; the new outer breakwaters have been designed to give an additional sheltered area of about 2,040 acres. Considerable dredging has been carried out in the harbour; the channel between the north and east breakwaters of the inner harbour has been dredged to a depth of over 40 feet. Then disaster came. A few minutes before noon on September 1, 1923, the earthquake occurred. In every little home in the town the housewife was preparing the mid-day meal over a fire, and this fact added to the catastrophe on land. As the dwellings collapsed the ruins were caught by the flames, which were fanned by a strong wind, and fires broke out all over the city. Water mains burst, and the survivors of the earthquake, unable to fight the fires, fled to the hills overlooking the city and gazed down on the flaming ruins. Oil tanks storing thousands of gallons exploded and blazing oil flowed into creeks and into the harbour in a sea of flame, setting fire to sampans, barges and launches. The landing pier collapsed, nearly all the quay walls were damaged, part of the breakwaters crumbled and disappeared under water, sheds and warehouses tilted and caught fire, cranes toppled into the harbour, and the work of many years lay ruined. Ships in the harbour came to the rescue of people on shore by taking refugees to other ports and by landing supplies. Within two months of the catastrophe, on October 20, the enormous task of reconstructing the harbour was begun. Almost every inch of the 6,800 feet of quay walls had been damaged, and only the corners were intact. The earthquake had tossed debris into the water, so that much of the area alongside was foul. In some places the walls had tumbled towards the water, and in others away from it, so that every section presented difficult problems to the builders. The earthquake did not affect the depth of water in the harbour, but much wreckage had to be removed, as a number of burning lighters and boats had caught fire while alongside wharves and, having been blown off the shore by the wind, had foundered. The essentials of reconstruction were speed and strength; the port had to be put in order quickly but the repairs had to be made sufficiently strong to stand any further shocks. The heads of the breakwaters, including the two lighthouses, had sunk about 12 feet, and, although the parts near the land were not badly damaged, considerable lengths were shattered just where protection was most needed. As the quay walls were destroyed and ships could not get alongside, cargo had to be discharged into lighters. In bad weather the sea rolled in over the sunken and damaged breakwaters so that all work of unloading had to stop. It was clear that the first task was to reconstruct breakwaters and to repair quay walls. Newly extended parts on either side of the landing pier had escaped much damage, and temporary repairs made them fit to receive ships. Old concrete blocks from the broken quays were used to repair breakwaters and sea-walls. Reinforced concrete caissons were needed for the new quay walls. But there was no adequate plant for making these quickly enough to keep pace with the time-table. It was decided, therefore, to supplement those supplied by contractors with bottomless, reinforced concrete caissons made in a temporary yard. Repairs were carried out in advance of schedule. The breakwater was repaired first, then the quay walls and the barge walls, and finally the landing pier. Concrete blocks were set along the edges of the sunken break-waters, and mass concrete was deposited between and above the blocks. Huge masses of concrete, which had broken when the quay walls at one part of the harbour had collapsed, were so heavy that the cranes could not lift them. The rubble had to be removed by dipper dredgers, grab dredgers and sand pumps before the huge concrete blocks, 36 feet long, which had fallen into the harbour, could be tackled. These big masses were broken up by explosives so that the cranes could lift them. The surface of the concrete was cleaned, tins of explosive were attached to the surface at suitable places, and the charges were fired by electricity. The cement between the blocks was cut by explosives or by a rock-cutter. A BUSY QUAYSIDE at Yokohama. This picture shows only a small section of the great port. Harbour craft seen in the foreground carry cargo from the big ships to the shore. Some 3,000 lighters and numerous other vessels work in the harbour. Sand and mud under the ruins were cleared so that there was space to level the foundations for the new caissons with bag-concrete. The rubbish from the wrecked wall obstructed the foundations of new piers, and twenty piers were constructed. The main body of each pier consisted of a concrete caisson 27 feet long, 17 feet wide, and from 29 feet to 33 feet high. These caissons were built in the dry dock of the Asano Dock Company, and the dock was flooded so that the caissons could be towed out to their correct positions and lowered by the engineers. Reconstruction of the landing pier was the last part of the work. The broken cast-iron screw-piles and the twisted steel beams of the old pier formed an obstruction on the harbour bed. The bolts and rivets had to be cut by divers or by explosives, and the litter of steel and iron lifted by floating cranes, before the rebuilding could be started. Clearing the harbour and the basins of wreckage was in itself a great task. More than 400 sunken lighters and eighty other vessels were dredged up as well as great quantities of cargo that had sunk with them. Within two years of the earthquake reconstruction was completed, and the programme of extension, which had been interrupted by the catastrophe, was resumed. Railway facilities are excellent, and the equipment of the port is first-class. A notable building is the new Customs House. The average difference of ordinary spring tides is only about 7 feet, and constant dredging is increasing the depth of water, so that the harbour is available for the largest ships. The principal imports are cotton, wheat, wool, oil, beans, fertilizers, timber and machinery; the chief exports are silk and silk piece-goods, clothing, tinned salmon and tinned crab, other piece-goods and manufactured articles. Equipped as the port is with modern machinery and having been rebuilt, those who look for the glamour of the East there will see only business-like efficiency and little of the past. Although it is not on the date-line, Yokohama is practically on the other side of the earth from London, and marks the end and beginning of the routes of a number of lines. From America, Yokohama is the first port of call for most trans-Pacific vessels. One of the best-known lines is the Nippon Yusen Kaisha, which is the largest and oldest Japanese shipping company, operating a fleet of more than 150 vessels, with a total tonnage of over 880,000 gross. The company flag is two horizontal red stripes on a white ground. The company’s vessels include some fine motor-ships, passenger ships and cargo vessels, which are on various routes, including those serving London, California and South America. The Yasukuni Maru and Terukuni Maru are two 12,000-tons motor liners on the European service. These two motor liners on the route from London are seventeen-knot vessels with Sulzer-Diesels on twin screws, and were built at Nagasaki. They do the voyage in thirty-eight days. The eight steam liners are between 10,000 and 10,936 tons each. Outwards from the port of London the first call on this route is at Gibraltar, 1,315 miles. To Marseilles is 695 miles, after which the vessel steams 457 miles to Naples. The next call is at Port Said, 1,115 miles, the gate to the Suez Canal, Suez being over eighty miles from Port Said. The vessel steams through the Red Sea, and stops at Aden, a run of 1,310 miles, and 2,100 miles farther bring her to Colombo, Ceylon. It is another 1,280 miles to Penang, after which the ship steams 390 miles to Singapore and then 1,440 miles to Hong Kong. The distance to Shanghai is another 830 miles, and the next run of 550 miles is to Moji, the port at the western entrance to the famous Inland Sea of Japan. The width is only about four miles between Moji and Shimonoseki, which is opposite. The Inland Sea teems with fish and has played a prominent part in the story of Japan. The distance from Moji through these tranquil waters to Kobe is 240 miles. THERE ARE BERTHS FOR SEVENTEEN SHIPS at the quays in the port of Yokohama. In the entire inner harbour there are also twenty-three buoys for mooring ships, additional berths for seven, dock accommodation for thirteen, and a pier which gives mooring room to four ships. The total capacity of both inner and outer harbours at Yokohama is well over 109 ocean-going vessels. The harbour possesses some 3,000 lighters and many different types of tugs. Called the Seto-Naikai or “Sea within Channels” by the Japanese, the Inland Sea is a chain of five seas linked by channels. It is entered from the Sea of Japan on the west through the Shimonoseki Straits, and ends on the east at the Bay of Osaka, the length being about 310 miles, and the breadth from north to south about forty miles at the widest part. On the south-west the Bungo Strait connects it with the Pacific, and on the south-east the Yura and Naruto Straits afford another exit to the Pacific. The most direct route from Kobe to Nagasaki and Shanghai is comparatively shallow, depths varying from 50 to 540 feet, and the currents in the straits are rapid. There are shipyards and docks, and the Inland Sea is the cradle of Japanese sea-power. Formerly, sailors, fishermen and pirates came from the districts on its shores, and when Japan came under Western influence most of the sailors for her fleet were recruited from the Inland Sea. A long archipelago extends along the northern shore, providing beautiful scenery. Kobe - the final port of call before Yokohama - which taps a great industrial district, and is a larger city than Yokohama, its rival, retained much of the silk business that was diverted to it by the earthquake of 1923. The run of 350 miles from Kobe to Yokohama is through the Yura Strait into the Pacific round Cape Shionomisaki, between Oshima Island and the Izu Peninsula, and so into the Uraga Channel. The distance from London by this route is 12,160 miles. The P. & O. line runs a fortnightly service from London by a route that is slightly different from that of the Japanese company. These liners call at Gibraltar, Marseilles, Port Said, Aden, Bombay, Colombo, Penang, Singapore, Hong Kong, Shanghai, Moji and Kobe. The Blue Funnel liners start from Liverpool and the service is monthly, via the Suez Canal and Shanghai. Other lines connecting with Europe are the Hamburg-Amerika, the Lloyd Triestino branch of the United Italian fleets, the North German Lloyd and the Messageries Maritimes, in addition to numerous regular cargo liners. On the other side of the world, fast liners link Yokohama with Canada and the United States. The Canadian Pacific liner Empress of Japan holds the Blue Riband of the Pacific, and this company operates between Yokohama and Vancouver. The biggest liner on this route, the Empress of Japan, is the largest and fastest ship operating between North America and the Orient, having a gross registered tonnage of 26,000. Her sister ship is the Empress of Canada, 21,500 tons. The two liners on the direct route are the Empress of Asia, 16,900 tons, and the Empress of Russia, 16,800 tons. The distance by the direct route is 4,283 miles, and the time is ten days; the passage via Honolulu takes thirteen days. These all-white ships, with their swimming pools, cafes and playgrounds, are among the finest in the world. The Empress of Japan, speed 23 knots, is the flagship of the company’s Pacific fleet. She has a red and gold palm court and ball-room, a veranda cafe, suites with private verandas, and a children’s room. The Empress of Canada is noted for her long gallery, her card-room and her gymnasium. From Vancouver these two ships reach Honolulu in five days, Yokohama in thirteen, Kobe in fourteen, Shanghai in sixteen, Hong Kong in nineteen and Manila in twenty-one. OUT OF CHARRED RUIN AND WRECKAGE rose the modern city of Yokohama, after the terrible disaster of September, 1923, when the port was devastated by fire and earthquake. It took two years for the Government and the municipal authorities to reconstruct the harbour after the earthquake. The reconstruction of the city took six years and was carried out on the American plan, and the city is now divided into five wards. The present population of Yokohama is over 709,003. The sister ships Empress of Asia and Empress of Russia sail direct to Yokohama in ten days, Kobe in eleven, Nagasaki in twelve, Shanghai in fourteen, Hong Kong in seventeen and Manila in twenty. These vessels and the crack ships of other lines are making the Pacific the playground of western Americans, as in their luxury and speed they compare with the great Atlantic liners. Twenty-one-knot motor liners with a gross tonnage of 17,500 of the Nippon Yusen Kaisha make the passage between San Francisco and Yokohama, via Honolulu, in about fourteen days. This service extends from Los Angeles to Hong Kong and is a fortnightly one. 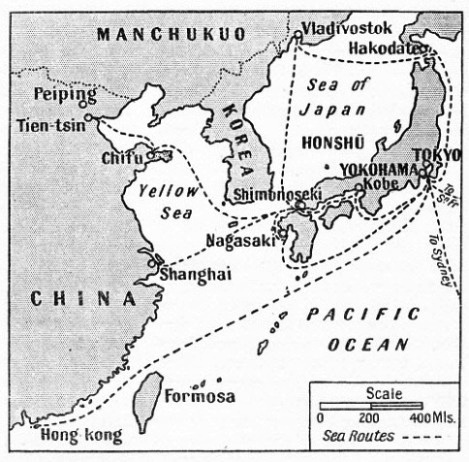 There is another from Vancouver, Victoria, and Seattle to Yokohama and on to Hong Kong, the passage between Yokohama and Seattle taking fourteen days. Another famous company which makes Yokohama a port of call is Dollar Steamship Lines, the vessels of which include two 22,000-tons twenty-one-knot liners of the President Hoover type. Yokohama is a port of call on the route between New York and Manila via the Panama Canal, and passengers embarking at Yokohama reach New York in thirty-nine days, or San Francisco in seventeen. Vessels of the Blue Funnel Line on the Philippine Is. to America service call at Yokohama. Ships of the Osaka Shosen Kabushiki Kaisha Line, on a round-the-world service, also call there. In addition, there are services to South America, South Africa, and to Australia, so that Yokohama is one of the most accessible ports in the world. The city has been re-built on the American plan and is divided into five wards. When built in the last century, it was divided into two districts, Kwannai (inside the barrier) facing the harbour, and Kwangai (outside the barrier), this second district forming the Japanese quarter. The district on the low hills south of the town was called the Bluff, and that on the hills to the north-west became known as Noge. Practically all the public buildings, consulates and offices are now in one half of the former Kwannai, and the shopping streets of Benten-dori and Honcho-dori are in the other half. The esplanade along the water-front is the Bund. One side of this is laid out as Yamashita Park, and hotels, clubs and offices are on the other. All the other parts of the city are Japanese. The theatres and cinemas are in Isezaki-cho or Theatre Street, near which is a Shinto shrine, dedicated to the goddess of Yokohama when the port was a tiny fishing village. Yokohama Park, which was laid out in the early days of the Settlement, was a place of refuge during the earthquake. A good view of the city and harbour is obtained from Nogeyama Park, the largest in the city, which is on the side of a hill. This park was made after the earthquake, and relics of the disaster are housed in the Earthquake Memorial Hall near by. A reservoir of the waterworks is in the park. Although the Bay of Tokyo between Yokohama and the capital is shallow, the sea quickly becomes choppy in a strong wind, especially in winter, and hampers sampans, barges, and lighters heavily laden with goods to and from Tokyo, many small craft and their cargoes being damaged in bad weather. As big vessels on foreign routes cannot reach Tokyo, import and export manufacturers find Yokohama more suitable for their factories. The road and railway facilities between Yokohama and Tokyo are excellent; fast trains cover the distance in about half an hour. There are five railway stations in the port and Yokohama Station is on the main line between Tokyo and Kobe. The fortunes of Yokohama are bound up with those of the capital, to which Yokohama is the gate. At the time of writing the population of Tokyo is estimated at approximately 5,663,000, making it the third city in the world. As the deep-water port of this intensely populated area, Yokohama is of paramount importance in the development of the Japanese Empire. Its revival after the earthquake, and the progress it has made in the last few years, are among the major achievements of the Japanese, and symbolize the enterprise of the most remarkable nation in the East. 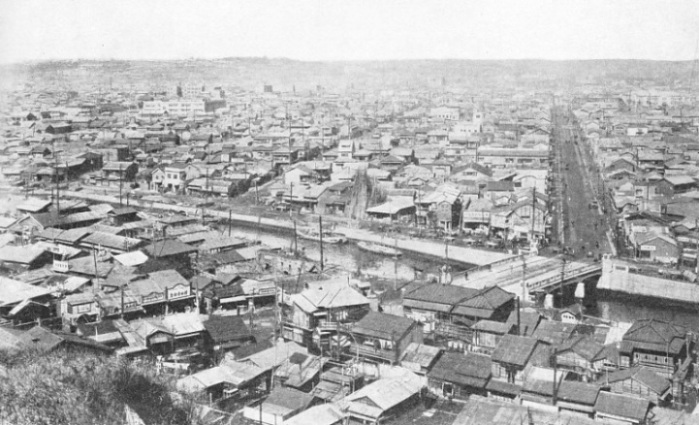 GENERAL VIEW of Yokohama. Half of the eighteen-miles coastline of the city is covered by docks and warehouses, and much land is constantly being reclaimed for industrial sites. The principal imports are cotton, wheat, wool, oil, beans, fertilizers, timber and machinery. The chief exports are silk and silk goods, clothing, tinned salmon and crab and miscellaneous articles. Yokohama is the first port of call for most trans-Pacific liners coming to Japan and the Orient from America. You can read more on “Japanese Bulk Cargo Carrier”, “Japanese Inland Sea Passenger Ship” and “Japanese Shipping” on this website.